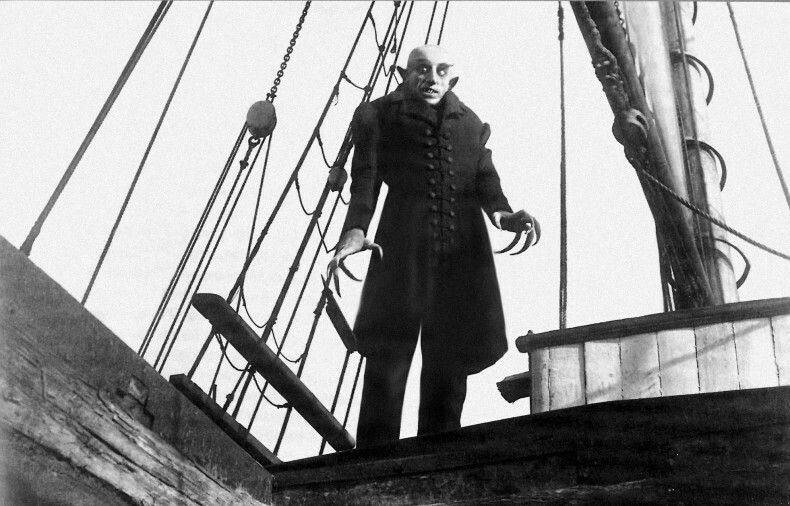 With beautifully haunting direction and cinematography, "Nosferatu" is one of the founding fathers of horror on film, and retains its bite some 90 years later. “Nosferatu” begins with a haunting portent of the Great Death that will consume the small town of Wisborg, Germany: “Nosferatu: Does this word not sound like the deathbird calling your name at midnight? Beware you never say it – for then the pictures of life will fade to shadows, haunting dreams will climb forth from your heart and feed on your blood.” Hutter (Gustav von Wangenheim) is a doting husband and family man who is employed by a mysterious local estate agent Knock (Alexander Granach). Receiving word that his Grace from Transylvania, Count Orlok (Max Schreck), would like to purchase a home in Wisborg, Knock sends Hutter to the Count’s castle with the promise of a hefty commission. Traveling the great distance to “the land of phantoms,” Hutter arrives at Count Orlok’s castle in the dead of night. When he nicks his finger while slicing himself a chunk of bread, he notices a sudden change in the otherwise calm and stationary Orlok. Beginning to sense a terrible secret behind Orlok’s shadowy facade, Hutter becomes entwined in a waking nightmare. Murnau depicts his protagonists with a gentle kindness that may seem overly cartoonish to modern viewers. Murnau introduces his audience to Hutter and his wife, Ellen (Greta Schröder), with a brightly-lit shot of the two as they merrily glide through their day; Hutter, on this occasion, having been kind enough to pause and pick some fresh flowers for his new bride. Upon her receipt of the flowers, Ellen remarks that he should not have killed such beautiful flowers; the couple embrace, and everything seems right with the world. Murnau uses this jovial and lighthearted introduction to make their downfall all the more dreadful to behold. Murnau employs a massive tonal shift in the film shortly after Hutter leaves Germany. After leaving a hotel to make the final push for Orlok’s Castle, his guides refuse to cross the mountain path, and Hutter is forced to continue on foot. With an inter-title to introduce a sickening premonition felt by Hutter, the film immediately begins its descent into darkness. With the arrival of Count Orlok, Murnau modifies the action to take place mostly at night (with 1920’s technology, this simply means switching to a blue-tinted film stock). With a cooler palette for the film, and the use of early German Expressionist shadowing, Murnau creates a mood of eerie unease. Always the innovator, Murnau uses a myriad of camera techniques to either set the mood, or accomplish feats of cinematic “magic.” Using stop-motion photography, he gives Count Orlok powers of telekinesis, and gives his shrouded carriage a bizarre, arhythmic momentum. Beautifully setting the scenes for his audience, Murnau’s focus on landscape can be breathtaking. A sunrise shot behind a tree-covered hill, and the rolling, grassy hillside of the rural village give a sense of location, but also a sense of trepidation with beauty juxtaposed so closely against the horrors to come. Max Schreck gives, without a doubt, one of the greatest film portrayals of the infamous Count Dracula. Although measuring a rather tall, 6′ 3”, he is hardly a daunting figure, due to his remarkably thin frame. The far more stocky and robust Hutter would very likely outmatch the gaunt Orlok. However, Schreck’s jarring movements (in part due to Murnau’s direction) and strange demeanor make him a much more terrifying adversary. His cold confidence, and strange behavior evoke a sense of mental disturbance, and lend an air of disquietude to the character. Compounded with his almost skeleton-like appearance, and his frantic and unpredictable movements, Schreck seems more like a crazed animal – wild and desperate for its next meal. As one of the first horror films ever made, (behind “The Cabinet of Dr. Caligari,” “Genuine: A Tale of the Vampire,” and “The Golem”) “Nosferatu” is bolstered by F.W. Murnau’s immeasurable talent, and earns my distinction as the first truly scary movie ever made.